The slovakian members of socioMovens e.V. have organized youth-social project weeks several times already in their home country in the past years. 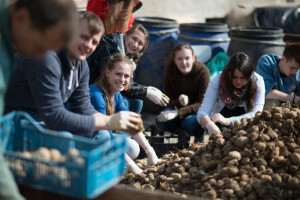 In fall 2015 the fourth youth project week took place in Kysak, fort he second time already. The start of a tradition. After a succesful start of the pilot week Kommende Dortmund and ist foundation started a project week with 22 students in Spisska Kapitula, April 2013. This time it was about the reinforcement of social awareness. Beside the content-related work, the visit of a Romani-settlement, a recuperation centre and an orphanage formed the focal points of the ecounter. The joint communal life, which was especially intensified through prayer and reflection, was also of great importance. ces- in community and prayer- became the sign of a conscious lifestyle of mutual consideration, which the young people try to implement in their daily lives.